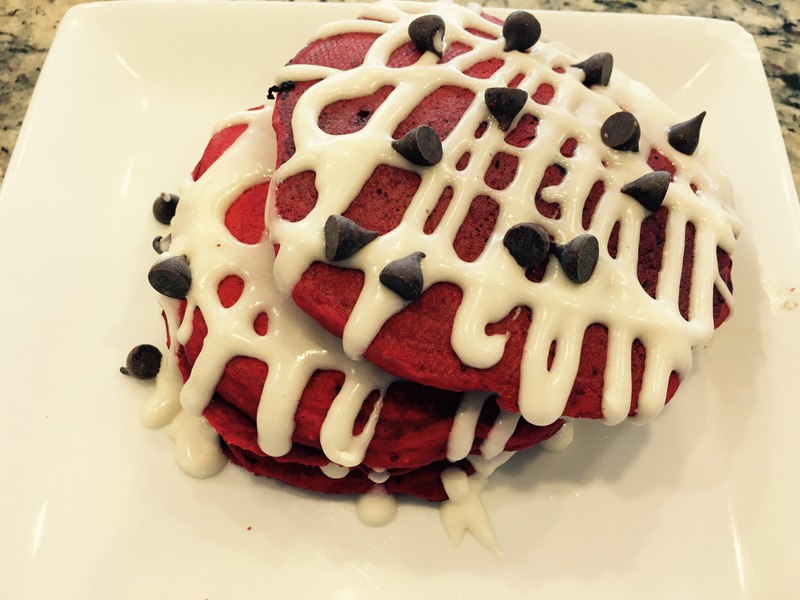 Once you read this recipe you are going to ask a few questions so let me get this out of the way first…. Why Bisquick? For starters, Bisquick is accidentally vegan and it’s a staple in many homes due to the convenience and ease of the product. 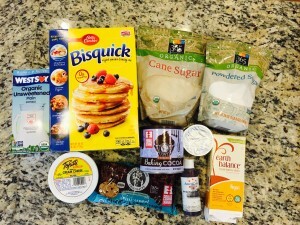 Let’s say you are out of town visiting family, chances are you can make a killer batch of vegan pancakes on the fly that everyone can enjoy by grabbing their beloved box of Bisquick and replacing the milk for your preferred vegan milk of choice and swapping the eggs for applesauce (roughly 1/4-1/3 cup applesauce per egg). I find plain unsweetened apple sauce yields a fluffier Bisquick pancake. I know the vegan police will shun me for using such a product but let’s face it, we live in a nonvegan world and I, for one, am thankful that I can tell those who are vegan curious that they can have things that they are already familiar with. Furthermore, making veganism (in the form of clothing, toiletries, food, etc.) affordable and accessible will result in more people willing to go vegan! The regular box of Bisquick is vegan and I am told many other varieties of Bisquick are vegan as well. Always check the box or Google the product name and put the word “vegan” next to it. Another cool option is to use the Is it Vegan? app which is handy to have while grocery shopping! 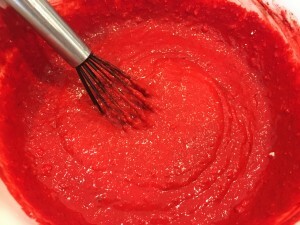 Why food coloring…why not beets? 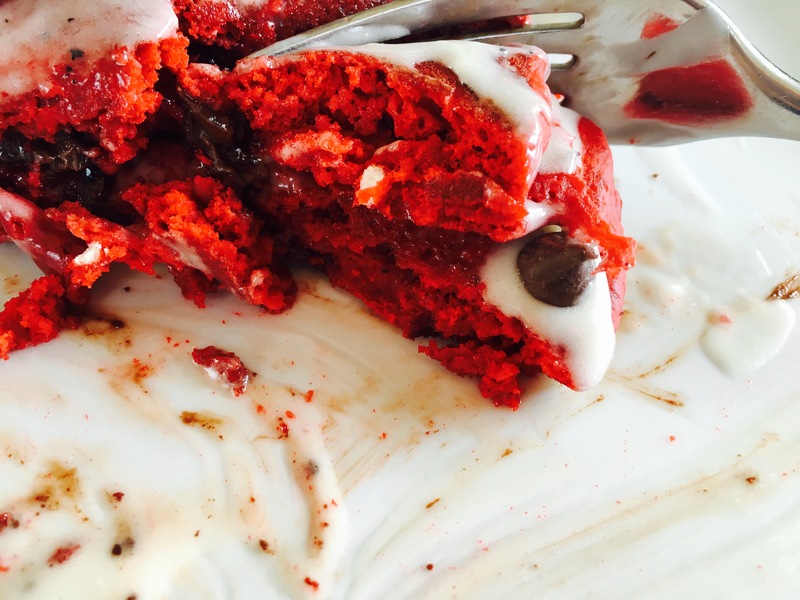 Historically speaking, Red Velvet Cake uses red food coloring to achieve the iconic color we all know and love today. 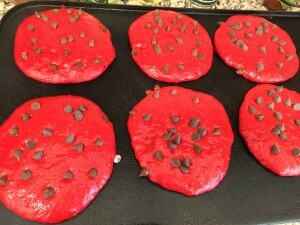 For vegans, we know all too well that red food coloring may contain carmine, which is derived from a special insect known for giving a reddish hue when they are ground into a powder and prepared accordingly. Because of the growing numbers of people allergic to carmine, less companies are using it and as of 2006, the FDA in the United States has required that products containing carmine must be specifically labeled (meaning no “mystery words”…however, the word “cochineal extract” may also be used in place of carmine). To my knowledge, Wilton and all of the Americolor brands of food coloring are vegan friendly and I personally prefer AmeriColor food coloring because it is brighter and more predictable. And as always…check the label! 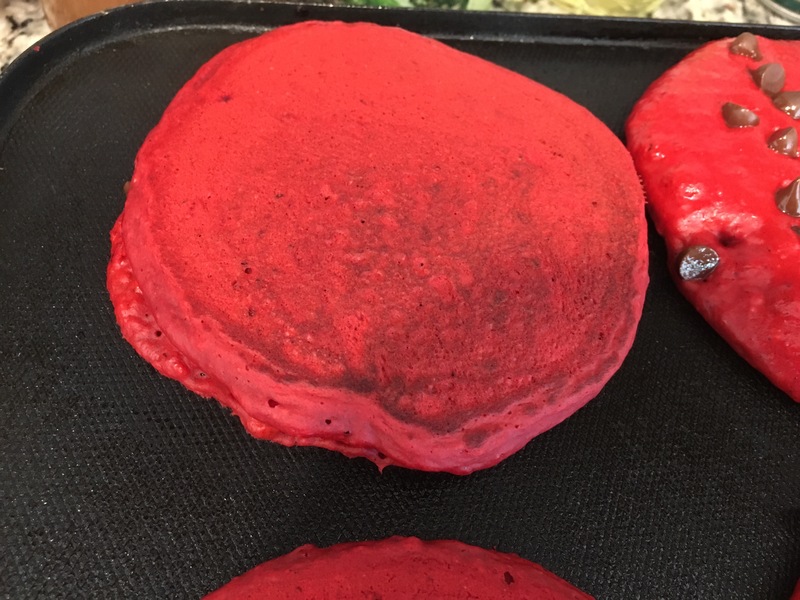 Now to the beet portion…You can color any food red by using beets or beet powder but when using fresh beets, cooking them is an extra step which is not the point of this recipe nor is waiting around for a sale on beets. Also, beets aren’t the most reliable food color and can easily change the taste of your food. I find if you use too much of it, you will taste the “earthy” flavors of a beet which will ruin your recipe. Using beet powder as an option is expensive and for many folks who don’t live near a health food store, this is hard to come by. And again…beet powder has the same issues as using regular beets. Can this recipe be made gluten free? Personally, I rarely enjoy gluten free pancakes and have not been able to make them gluten free as of yet. But you’ll be glad to know that Gluten Free Bisquick is vegan! If any of you make this recipe gluten free, let me know! I would love to share with my readers and give you full credit, of course! Can I use another egg substitute other than applesauce? The quick answer…I doubt it! 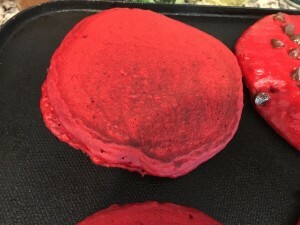 When my husband and I went vegan many years ago, we tried all the tricks of the trade in our beloved Bisquick pancakes. We found bananas made the pancakes gummy and the banana flavor was overwhelming no matter if it was green or ripe. Flax seeds lacked the fluffy texture and using Ener-G Egg Replacer made them the consistency of cardboard. Applesauce is cheap, accessible, and magically works miracles as an egg replacement for Bisquick pancakes. 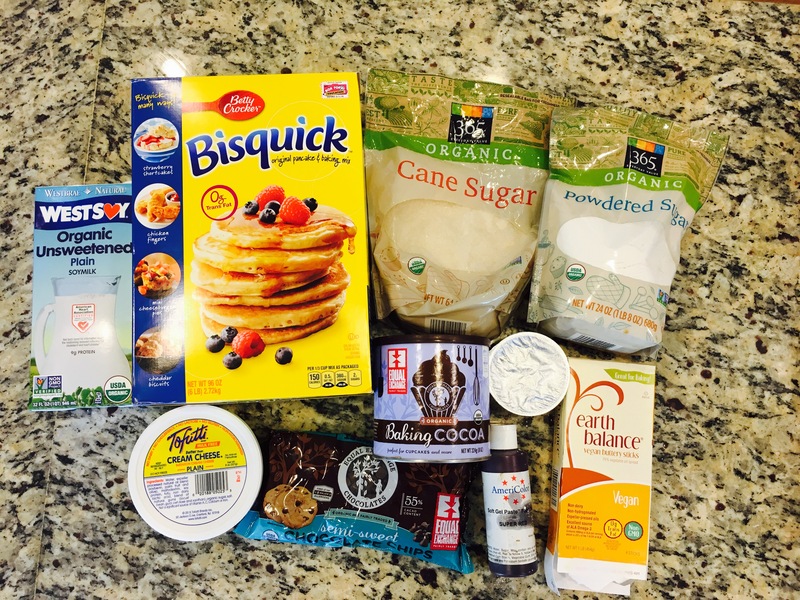 Can I use another pancake mix or vegan cream cheese? Again, this recipe was created to be simple and use ingredients you can find in most stores. If you use another brand of pancake mix and like it, let me know and again, I will update the recipe and give you credit. My vegan cream cheese of choice in baking has got to be Toffutti brand. Sure, we have loads of vegan cream cheese options but sadly many of them are only good on a bagel and don’t hold up well in baking. Also there are artisanal cream cheese brands like Kite Hill that I love but are extremely pricey and are only exclusive to Whole Foods which means you are out of luck if you live in a small town. Toffutti brand vegan cream cheese from my personal experience can be found at most grocery chains in the refrigerated natural foods section. I sure hope I answered all concerns and now onto the recipe!!! Not everyone can take an aerial shot from a kitchen ladder and live to tell the tale! First make the Cream Cheese topping. In medium bowl, beat vegan cream cheese, Earth Balance and 3 tablespoons vegan milk with electric mixer on low speed until smooth. Gradually beat in 2 cups of sifted powdered sugar, 1 cup at a time, on low speed until topping is smooth. Cover; set aside. In large bowl, stir all pancake ingredients except chocolate chips with wire whisk until well blended. Heat griddle or skillet over medium-high heat (350-375°F). (To test griddle, sprinkle with a few drops of water. If bubbles jump around, heat is just right.) Brush with vegetable oil if necessary or spray with cooking spray before heating. 3. 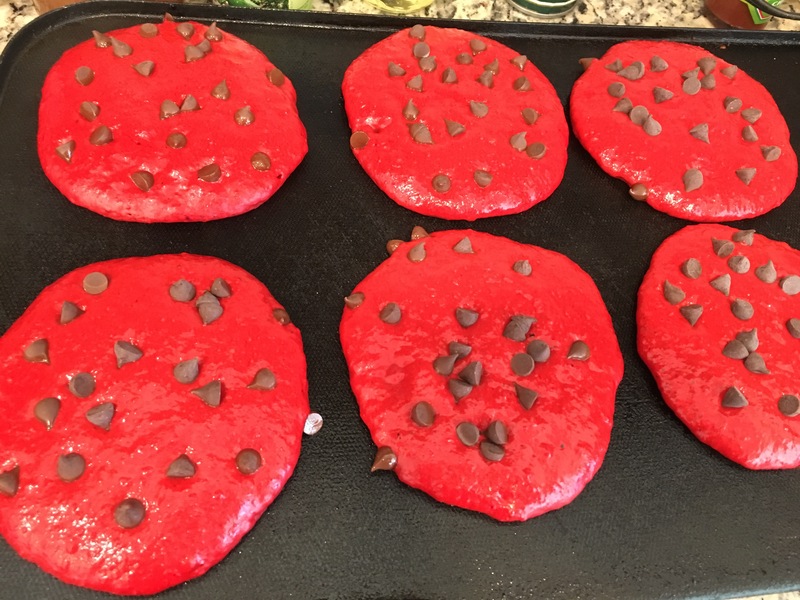 For each pancake, pour about 1/4- 1/3 cup batter onto hot griddle and sprinkle with chocolate chips- the amount is whatever you prefer but make sure you save some extra chips as topping. Cook 2 to 3 minutes or until bubbles form on top and edges are dry. Turn; cook other side until golden brown. This entry was posted in recipes and tagged bisquick, Breakfast, comfort vegan food, egg replacer, family, pancakes, red velvet, vegan by Robin. Bookmark the permalink.